Grab the nearest co-worker and head out to a food truck for lunch. Do both of yourselves a favor though and don’t talk about work for the next hour. 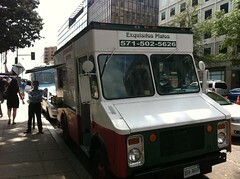 Just enjoy the empanada/sandwich/cupcake/taco/pho/insert-other-food-from-a-truck.